This easy-to-make, satisfying, nutrient-packed veggie burger recipe has quickly become a staple in my kitchen! I had the pleasure of reviewing Laura-Jane Koers' (AKA the TheRawtarian) debut cookbook which features 100 quick and easy plant-based recipes using 10 ingredients or less! With a personal collection of over 30 vegan cookbooks, I love supporting the vegan community and sharing new cookbooks from authors that I respect and admire. I was very excited to learn that Laura-Jane, who is a fellow Canadian, hailing from Halifax, Nova Scotia, was releasing her first cookbook this year! Her cookbook, filled with gorgeous food photographs, is an amazing resource for anyone looking for incredibly healthy recipes made with everyday ingredients. Laura-Jane has included both raw and cooked recipes for everything from breakfast, to main dishes, snacks, desserts, as well as kitchen staples too. What I love about this cookbook is that many of the recipes include the option to use an oven or dehydrator. I also really appreciate the fact that the ingredients she uses are all easy to find, and many of which were items that I usually have on hand. Lately, I've been loving Laura-Jane's delicious Plant-Protein Burgers with Hemp Seeds and Vegetables. These burgers are quick and simple to make, and turned out great for me when I made them in both the oven and dehydrator! These burgers keep really nicely and are very satisfying. They are super tasty served at room temperature, so they work well for a packed lunch on the go. You can totally serve these on a bun with all the burger toppings, and they are equally as tasty as a protein-rich salad topper. They're so good, I've even eaten them without any toppings at all. Basically, I love these burgers and I hope that you do too! Laura-Jane has generously shared her recipe for her delicious burgers. Keep reading for the recipe and learn how you can win a copy of her beautiful new cookbook! Plant-Protein Burgers with Hemp Seed and Vegetables. Photo from Cook Lively! by Laura-Jane Koers. Having an easy-to-make, satisfying veggie burger recipe in your arsenal is key, and this Plant-Protein Burger recipe does the trick. These flavorful burgers get their moist texture from hemp seeds, which also give them a protein boost. This recipe can be made in the oven or in the dehydrator. (If dehydrating, bear in mind that the patties will shrink significantly in size once the moisture is removed.) These plant-filled burgers are perfect sliced on top of salads or in wraps, but, for the ultimate burger extravaganza, serve them in a lettuce bun with Maca Mayonnaise (page 230) and Catch-Me Ketchup (page 229) and a side of Spiced-Right Yam Wedges (page 121)! If you'd like a more traditional bun, make a batch of Cauliflower Toast (page 56) and form the dough into small rounds before baking or dehydrating, as shown here. 1. Preheat your oven to 350°F. Line a rimmed baking sheet with parchment paper. Set aside. 2. Add the sunflower seeds, flax meal, salt, and nutritional yeast and dill, if using, to your food processor. Process into a flour-like powder (30 seconds). Transfer the mixture to a large bowl. 3. Add the veggies, hemp seeds, and garlic to the large bowl. Stir. 4. Add the lemon juice and 1 tablespoon water. Stir again until well combined. 5. Using your hands, form the mixture into 4 patties, about ½ to ¾ inch thick. Place them on the parchment-lined sheet. 6. Bake for 15 minutes. Flip and cook for another 20 minutes (35 minutes total). Let cool slightly before removing from sheet. 7. Enjoy immediately. Store leftovers in the fridge in a semi-tight container for up to 3 days. 5. Using your hands, form the mixture into 4 patties, about ½ to ¾ inch thick. Place them on the parchment-lined tray. 6. Dehydrate at 145°F for 1. hours. Reduce the temperature to 104°F and dehydrate for another 6 hours. About halfway through the 6 hours, once they are holding together, flip them over and continue dehydrating until they reach the desired consistency—somewhat moist in the middle but hard on the outside. One lucky winner will receive a copy of Laura-Jane's beautiful cookbook Cook Lively! This giveaway is open to residents of Canada and the United States. For giveaway details and to enter to win please click here. 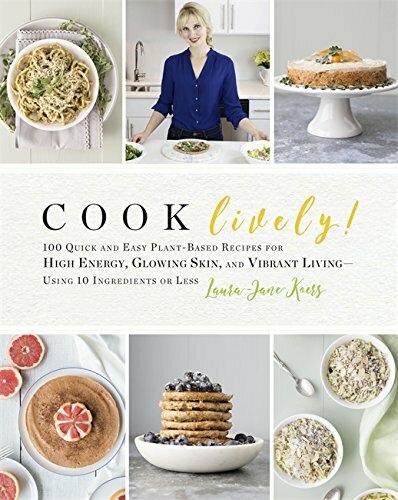 Excerpted from Cook Lively: 100 Quick and Easy Plant-Based Recipes for High Energy, Glowing Skin, and Vibrant Living—Using 10 Ingredients or Less by Laura-Jane Koers. Copyright © 2017. Available from Da Capo Lifelong Books, an imprint of Perseus Books, LLC, a subsidiary of Hachette Book Group, Inc.
Click here to see a full listing of Books and Cookbooks that I reccomend, including Cook Lively! that have helped to inform me on my vegan journey and have really inspired me along the way. This is not a sponsored post. I only share products that I personally use and that are made with the highest integrity. The cookbook featured in this post was kindly gifted to me for review. The Amazon links provided are affiliate links, which means that if you visit Amazon through these links and purchase product, I’ll get a commission. Don’t worry – the price doesn't change if you use my link, it's just a great way to help support the free content that I share!